While tiny homes appear to be gaining popularity, the majority of Americans are actually moving into bigger and bigger dwellings. 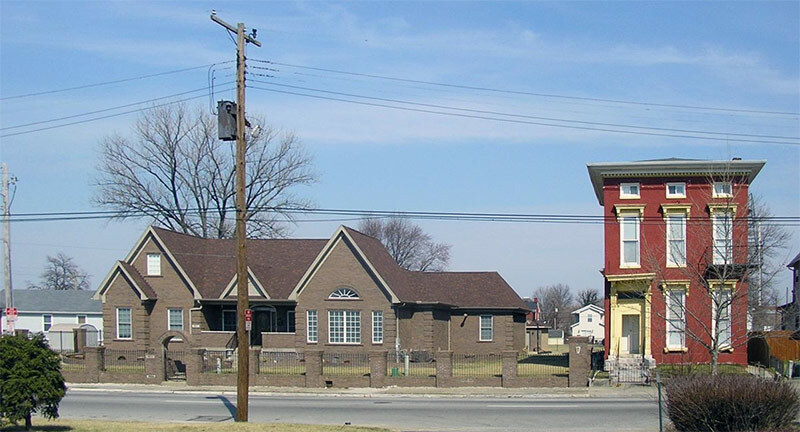 Houses are following the same trend as burgers and cars: they are getting super-sized. Americans are managing to squeeze more homes into areas with available land and even packing homes into areas with limited lot sizes. Unsurprisingly, the move toward McMansion homes is accompanied by a host of other changes to lot size and density. If the amount of available land is finite, how are Americans building bigger homes? While homes expand, lots are shrinking. Since the late ’90s, the median lot size of a new home decreased by 10 percent while the size of the home on that lot grew by 24 percent. In 1999, the median single-family home covered 2,100 square feet. 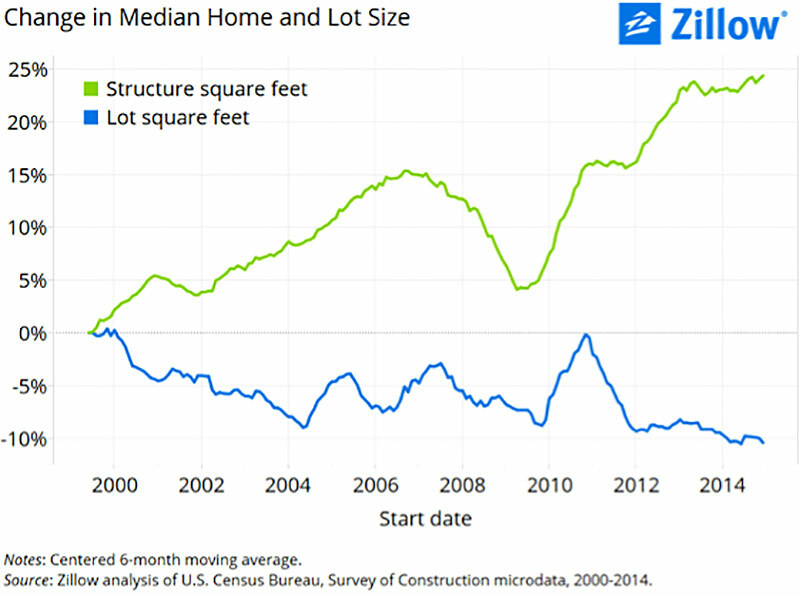 Fast forward 15 years and the median single-family home is now 2,600 square feet. Most of that extra square footage is used to build additional bedrooms and bathrooms in new homes. In order to build larger homes on the limited amount of available land, yard space is sacrificed. The ratio of yard space to indoor square footage decreased from 3 feet of yard space for every 1 foot of indoor space to just under 2 feet. Geographic location also plays a big, and somewhat surprising, role in changing lot and home sizes. From 2000 to 2014, lot and home sizes only stayed the same in two regions: along the West Coast and in New England. Both of these areas are densely populated, so building bigger homes or decreasing lot size any further was more challenging or impossible. In areas growing in popularity, like the Eastern Seaboard (New York to Florida), homes are getting larger but the lots are shrinking. 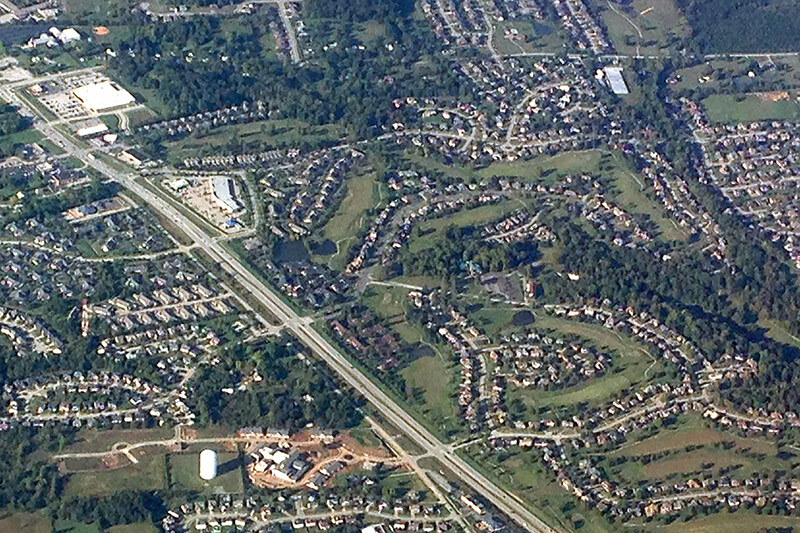 The rise of population density may be the catalyst for squeezing bigger homes into the available land along this strip. But homes built in the states between the Appalachian Mountains and Mississippi River increased both in square footage and lot size during the same time period. The availability of open space in many of these Midwest and Southern states, like Kentucky, may explain the ability of homeowners to scale their homes and lot sizes. 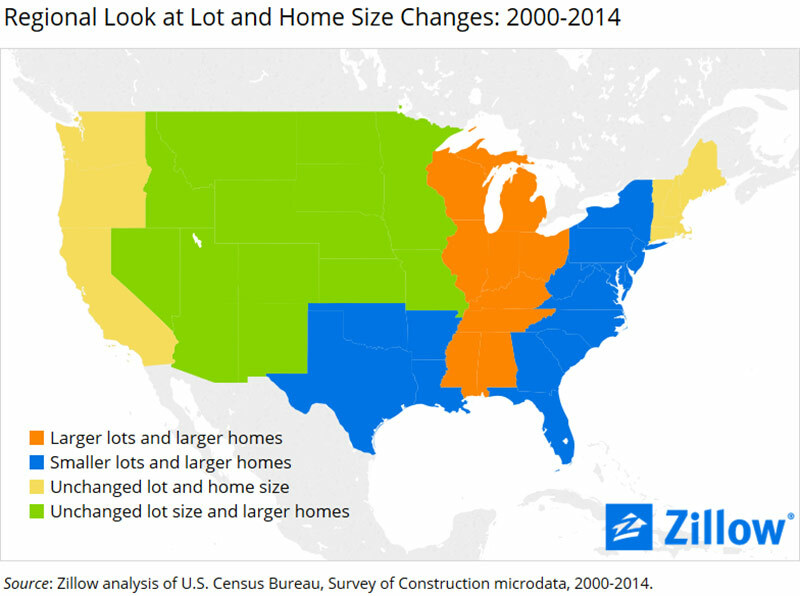 The most unexpected change in lot size is occurring in the Southwest and Great Plains. New homes are bigger but lot sizes remained unchanged in both swaths of land. Because available land is abundant in the middle of the country, it is surprising that lot sizes aren’t increasing along with the size of homes. The expected trend would be bigger homes on larger lots, similar to the Midwest and South. It’s unclear why the lot sizes aren’t scaling with home sizes in the Southwest and Great Plains. The trend of bigger homes coincides with the rise in popularity of McMansion homes. Formally known as millennium mansions, this style of architecture has dominated new construction since 1985. As the nickname for this style implies, these homes are marked by their mansion-like stature. They have large, tall exteriors and expansive interiors. To make way for more of these popular millennium mansions, the yards they live on are shrinking. In the next decade we may see different trends arise, but right now home buyers are saying bigger is better. Builders are meeting buyers’ expectations by creating large single-family homes in high-density areas. Of course, the tradeoff is less yard space, often what attracted people to the suburbs in the first place. But the rate at which these homes are selling indicates that homeowners are willing to sacrifice lawns and gardens for more bedrooms and bathrooms.